Madagascar, the world's fourth-largest island, is a fascinating country. Its long history as an isolated area has contributed to the development of a specific Malagasy culture. Although politically associated with the African states, Madagascar is not African; even if culturally inspired by Asia it is not Asian; and despite more than 60 years of French colonisation, it is not European. The country was ruled for many years by a Soviet-style one-party government. The mismanagement and erratic economic decisions of this Soviet-style era left Madagascar's economy in absolute chaos and totally disorganised. Marc Ravalomanana was elected president in 2002, and since then a new course of action has been determined for the country. However, Madagascar still has to cope with a glaring lack of adequate infrastructure of all kinds: transportation networks, under-funded health care and education facilities. When the present mayor of the country's capital city Antananarivo, Patrick Ramiaramanana, was elected in 2003, his team and the Municipality continued to deal with those problems that particularly affected Antananarivo. Thus, the municipality worked on the needs of the population, implementing actions initiated by his predecessor, who had been elected President of the Republic. The idea was to create a synergy between the people of Antananarivo and their leaders to rebuild the city through a vision of sustainable development using long-term programs. The Mayor’s program targeted Antananarivo as “a developed and clean city where people enjoy living”. Capital of Madagascar, Antananarivo is a clear representation of this situation. Situated in the centre of the island at a height of 1,400 metres, it is the largest agglomeration of the country with around 1.8 million inhabitants. It is the political, administrative and economic centre of the country. The principal city, “Commune Urbaine d’Antananarivo” (Antananarivo Renivohitra) brings together 1.2 million inhabitants, in an area of 85 sqkm, divided into six districts and 192 quarters (fokontany). Antananarivo is a city of contrasts: you will be instantly charmed by its setting amid a dozen hills; the vestiges of picturesque red-brick colonial-era houses, with their elaborately carved balcony railings; the still-impressive Queen's Palace (Rova) capping the central hill, central Lake Anosy, surrounded in the austral springtime by blooming jacaranda trees with lavender coloured flowers. On the other hand, you will be put off by the heavy pollution, infuriating traffic jams, the dilapidated condition of many buildings, roads and other infrastructures, and especially by the abject poverty of many of its citizens, visibly evident by the shanty dwellings that are to be found everywhere in the town. Rice fields, marshes, lakes, and growing suburbs occupy the vast and fertile plains surrounding the city. For many years the capital of Madagascar faced a wide range of problems mainly due to the above-mentioned political management and poor economic levels of achievement. Many districts of the capital did not have proper collective water points or sanitary blocks. Moreover, due to poor water management, some sensitive areas were damaged by annual flooding from tropical rains. This flooding led to a cholera outbreak in 2000. Roads were overused. Local infrastructures such as markets were over-crowded and did not provide adequate hygiene services, the lack of public lighting created increased criminality, and public gardens were not looked after by the municipal services. With the increased volume of vehicles in the city, traffic jams became a nightmare for both the users and the municipality that had to deal with them. Some strategic areas of the city came to a standstill during the rush hour, which was not good for the economy. 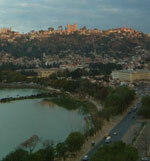 Antananarivo is a city that was designed and built for a population of less than 500,000. Today, with a total population of 1,800,000, most of the problems are due to this demographic increase. With statistics indicating that the population will double in the next 20 years, a different urban policy had to be designed and implemented. Actions implemented by the municipality: an urban renewal policy within a vision of sustainable development. A good road network is essential to the development of economic sectors. For example, the major city road that serves the economic and residential districts, the “RN1”, has been restored and local infrastructures were renovated along this road. Other roads, such as “Boulevard de l’Europe” and “Rocade du Marais Masay”, were built in marshy areas, in order to link districts without causing traffic jams in the inner city. The extension of the city of Antananarivo is being developed over rice fields, and this requires a network of canals and artificial lakes that drain the plain. New infrastructures were built that prevented flooding during the last wet seasons. Moreover, to resolve the traffic problem and to propose an alternative for transportation in the inner city, the Mayor launched a project for an “urban train” in 2003. This will call at many stations within the strategic districts of the city: economic and residential areas, the airport, etc. Some parts of the train have already been received from Switzerland and the municipality is waiting for the final funding in order to start the project (rehabilitation of the existing network, dieselisation of the locomotive, etc.). Public lighting has been extended to numerous other districts of the city. Sanitary blocks were constructed in poor districts, offering showers, toilets, and collective water points for the population. Other local infrastructures were set up. For example, the new wholesale market in Anosibe brings together more than 1,700 merchants in a safe and healthy environment that they themselves manage and clean with the help of the City’s technical services. • to reduce pollution and to provide modern parks and gardens for the population, to make the city more liveable where people enjoy living. A waste management policy is under review to enhance the environment and make the city cleaner. HIV / AIDS Test Centres have been built and are now accessible in most parts of the city for the people of Antananarivo. Such actions have had a real impact on the city and the population, and many changes are already clearly visible. • Aware of the improvements in various fields, the population of Antananarivo now actively participates in the development programs of their city. Local associations have been created within districts and are managed by its population. These associations help the inhabitants and the Municipality to respond to the needs of both entities and help the city to solve problems rapidly and in accordance with the needs of the population. For example, in the markets that the Mayor has set up, traders’ associations have been created and contribute to the local development of the districts. • Sanitary blocks, healthcare centres and collective water points help to diminish epidemic risks and enable people from the poor areas to live more decently. As a result, Antananarivo has not been confronted by cholera or other epidemics through insalubrious conditions. • The improved public lighting network reduces criminality and allows street vendors to work later. • The new road network reduces traffic problems in the inner city and makes Antananarivo more accessible for incomers and economic investors. As a result of this hard work, Antananarivo has shown a new face to its inhabitants and to the world. The actions and improvements carried out by the Mayor and the Municipality show a model of social change that has been achieved thanks to an urban renewal policy that could inspire other cities in similar situations. This exceptional experience was highlighted by the French President Jacques Chirac, who declared in 2004, during the inauguration of the national road to Anosibe, to the Malagasy President Marc Ravalomanana and the Mayor of Antananarivo, Patrick Ramiaramanana: “the improvement of living conditions is the result of good infrastructures”. Within the same framework of fighting the anarchic development of the city, the projection of the present policy remains the same: to fight poverty with a sustainable vision to make Antananarivo a more liveable city. Thus it remains to extend the electricity and water supply network to other districts still enclosed. The rehabilitation of these districts will act as models to launch similar operations in other districts of the city, as foreseen in the master plan of Antananarivo. The corporate actions initiated in establishing this project (accompaniment, awareness, appropriation) were a good example of what can be done, and will enable the municipality to continue in that way. Those changes have also been possible thanks to the desire of the Mayor to open Antananarivo internationally and to work with international partners. This work was rewarded in 2005 when the Mayor received the Metropolis Award 2005 in Berlin. On this occasion Patrick Ramiaramanana also became the vice president of the African Region to represent African countries in Metropolis. Antananarivo will host the Games of the Indian Ocean Islands in 2007. Application of this global policy, the projects and their impacts, the participation of the population and the international recognition of Antananarivo, would not be possible without the strong leadership exercised by Patrick Ramiaramanana. He has succeeded in being fully involved in the local needs of the city and its people, and in receiving the recognition and the support of international partners. The result of this policy has given a new life to democracy in Madagascar. Through communication, transparency and a strong desire to develop its capital, Patrick Ramiaramanana, as a new kind of Mayor, has brought confidence and trust to local politics, with an involvement of the population in its improved way of life. Patrick Ramiaramanana first joined the Municipality of Antananarivo in 2002 as an inspector. One year later, in December 2003, he was elected Mayor of the city, capital of Madagascar, while he was president of the special delegation of the Commune Urbaine of Antananarivo, created during the political events of 2001. Patrick Ramiaramanana studied at Düsseldorf (Germany) University where he took his doctorate in chemistry, specialising in electrochemistry. He then did research work at the Jülich Research Centre for several years before returning to Madagascar in 1997 to join the Tiko Group, where he held different managerial positions. In accordance with the Malagasy Government’s policies, the country’s development is strongly linked to municipal and regional development. Aware of this, Patrick Ramiaramanana vision is to develop local authorities so as to strengthen the capacity of the municipality and manage its development programs in each local district of the city. Thus, for the past two years, he has concentrated on the rehabilitation of Antananarivo to make it more liveable. His idea is to create a synergy between the people of Antananarivo and their leaders and to rebuild the city through a vision of sustainable development by applying long-term programs. The objective of the mayor’s program is to make Antananarivo “a developed and clean city where people enjoy living”. Because of his deep concern over local needs and the struggle against poverty and the social actions he has implemented, he has become very popular. In recognition of this, he was elected Man of the Year 2003 while he was still President of the Special Delegation. His experiences abroad, while studying and working, explain his willingness to open up Antananarivo to international recognition as a. special city with many assets. With this idea constantly at the forefront of his mind, he has participated in the work of different international organisations such as the Cités et Gouvernements Locaux Unis (CGLU) and the Association Internationale des Maires Francophones (AIMF) or Metropolis. The policy is proving to be a success in relation both to the international conferences that have taken place in Antananarivo this year and the investors that are arriving in the special economic zones. His strong leadership and concern for making Antananarivo a better place to live and to have international standing, resulted in his being presented with the 2005 Metropolis Award during the last conference in Berlin in May. On that occasion Patrick Ramiaramanana was also made vice president of the African Region to represent African countries in Metropolis.